Here’s some quick advice on setting up a digital mailroom and successfully maintaining digital mail processing. With the costs of a digital mailroom being significantly less nowadays, many more businesses are adopting a virtual approach to deal with their mail and it’s so easy, you can do it too! Setting up a digital mailroom can be done very easily, you just need to enlist the help of outsourced services. This will relieve the cost, time and stress that is involved in attempting to digitise the mail yourself. Digital mailroom services usually have the experience and the equipment to complete the process quickly and easily. We have spoken in the past about the many benefits you can get from adopting a digital mailroom but if you would like to refresh yourself of these take a look at our digital mailroom articles. I’d be lying if I said you won’t even notice the change but, due to the large amount of benefits digital mail brings, the adaptation process should be a positive, pain free and simple experience. All you’ll have to do is get used to receiving your mail digitally and storing it that way. Where you would usually check your in-TRAY for incoming mail, you should get used to just checking your in-BOX. In our increasingly digital world, this isn’t a hard adaptation to get used to in a similar way to changing your email address or getting a new computer. It’s different but not in a negative and obstructive way. 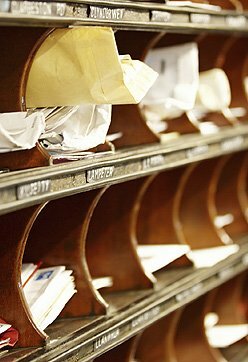 To maintain your digital mailroom system successfully, we advise you store the digitised mail comprehensively in a digital document management system. You should receive your mail as fully text searchable documents, once they have been scanned, so retrieving them from a system will be easy. The main thing to remember is only to print as a last resort if email or shared access is not available. Otherwise, the digital benefits will be lost. Once you have a digital mailroom up and running and you are reaping the benefits of going digital, it would be a great time to encourage other people in your network to switch to a digital mailroom. This will enable you to make your business correspondence with them quick and efficient to enable more work to be done (and you don’t need telling that more work done usually means more profit generated). Here at Pearl Scan we offer a flexible and cost effective digital mailroom service as well as excellent consultancy with our experts. We use top of the range scanners to ensure that your digital mail is in your inbox each morning in readable and searchable quality. If you would like some more information about this service, take a look at the information on our website or get in touch today for a free, no obligation quote.